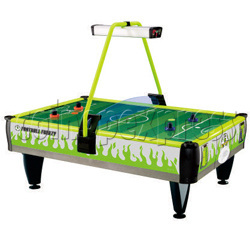 Football Frenzy Coin Operated Air Hockey ( 4 players) is an attractive bright air hockey table, comes with durable aluminum table, with football graphic appearance, features in durable playing surface, eye-catching overhead table lighting, which designs for up to 4 players for competitive play. Football Frenzy features with spectacular sound effects and dual ticket dispensers plus start push button on both sides for game play. It is a very attractive commercial air hockey table.